Who elects the President of the United States? Go to Electoral College and find out. The United States elects its president and vice president indirectly, using an "Electoral College." The Electoral College has nothing to do with education, and its members (called electors) never actually meet together. 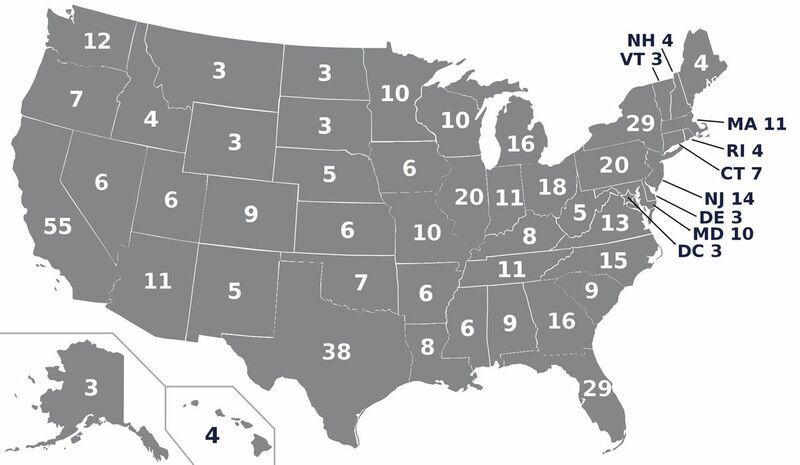 Members of the Electoral College are appointed by states. Voters cast their ballots on the Tuesday after the first Monday in November. (In 2016, election day is November 8.) This is the "popular vote." Although voters choose their preferred candidate—in 2016, the top contenders are Hillary Clinton, a Democrat, and Donald Trump, a Republican—the popular vote does not officially determine the president. The math adds up: There are 435 members of the House of Representatives, 100 Senators, and three representatives from the District of Columbia. So, there are 538 electors. Except for Maine and Nebraska, the Electoral College is a "winner take all" system. All electors vote for the winner of their state's popular vote, no matter how narrow their margin of victory. Candidates must receive more than half of the total votes to win an election. Half of 538 is 269, so a candidate must receive 270 electoral votes to win. One of the most popular election analysis sites is called FiveThirtyEight. Why? The 538 electors of the Electoral College elect the President and Vice President of the United States. Using the map provided by the U.S. Census (above), how many electors does your state have? How many members in the House of Representatives? Based on their number of electors, what are the least-populated states in the U.S.? Wyoming, Vermont, North Dakota, Alaska, South Dakota, Delaware, and Montana are the least-populated states. They only have one representative in the House, and three electoral votes. Most presidential candidates spend more time and money campaigning in California than any of its surrounding states. Why? California's huge population is represented by a whopping 55 electoral votes. That's more than twice the number of electors of all its neighbors (Oregon, Nevada, Arizona, Hawaii) combined. There are 538 members of the Electoral College. This number is based partly on population figures provided by the U.S. Census. If the population of the U.S. changes, in what presidential election (what year) will that change be reflected? In other words, in what year would FiveThirtyEight have to re-name itself? 2024. The Census is taken every 10 years, and presidential elections are held every four. The last Census was taken in 2010, determining the number of electors for the 2012, 2016, and 2020 presidential elections. The 2020 Census will determine the number of electors in the 2024 and 2028 elections. Do you think the Electoral College will get bigger or smaller after the next Census? What areas of the country do you think may have their number of electors shrink or swell? Answers will vary! The population of the U.S. may grow due to improving medical technology which allows people to live longer lives, more immigration, or increased birth rates. The population may shrink due to decreased birth rates, less migration, or more emigration. The populations of the Midwest and "Rust Belt" of the Upper Midwest and Northeast have been shrinking for decades as more Americans and new immigrants relocate to the coasts and the South. That trend may continue. However, oil and natural gas booms in the Dakotas and the Appalachian Basin have also led to increased population in those areas, and that may be reflected in the next Census. person who seeks elected office. electors representing all 50 states and the District of Columbia, responsible for officially electing the President and Vice-President of the United States. vote totals for a candidate or issue, made by all qualified voters. count of everyone in the U.S., conducted every 10 years.